Chris and I did something really crazy this week. Are you ready for this?? We went into Slumberland to continue looking for new chairs for my office. 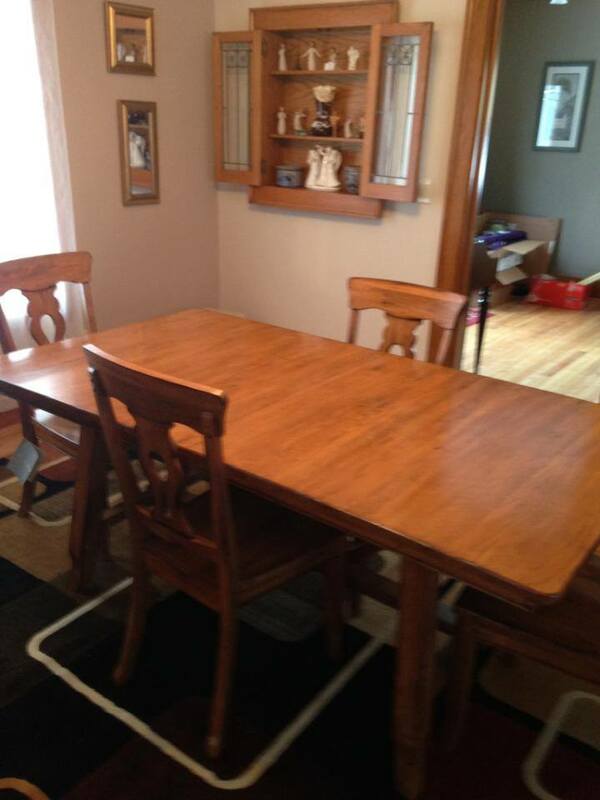 And we walked out with….wait for it….a dining room table! You weren’t expecting that little twist in this story, were you? The thing is, we’ve been looking for a dining room table. We’ve not been actively looking, but it’s been a back-burner thing. The table in our dining area now is large enough to seat dust bunnies–and that’s about it. Plus, we’ve had it for more than 15 years or so. I think we probably got it at like Big Lots or something. It has more than served its purpose. Anyway, we walked into Slumberland and as I was just about to call my search for office chairs as officially over (because, really, I found them about 2 weeks ago at Better Family Furniture), there it was. It was like one of those scenes in a movie when the main character finally finds whatever they’ve been looking for. A light shone down from heaven, the angels sang “ah.” Maybe it wasn’t like that. Maybe it was the clearance tag on the dining room set. We talked about it for all of about 10 minutes. Then we bought it. Just like that. This was a little crazy because we don’t work like this. We talk about major purchases, almost too much, research, then we enter into it with great hesitation, and very very slowly. It took us 2 years to plan our wedding. The fact that we did this, of course, made me feel a bit out of whack. I immediately had buyers remorse, even though I really love our new table–it just was delivered on Friday. We didn’t think about this very long. We just *bam* went and bought a dining room table. There’s no going back now. I have no idea what insane purchase we’re going to make next without really thinking about it. I really enjoy this story in today’s Gospel. I love a good call story. Many of you know, but just in case you didn’t, before I was called to be the Pastor to this amazing group of people here, I worked for Wartburg Seminary in Dubuque. I worked in Admissions and talked to people who were interested in going to seminary. I heard a lot of call stories. Stories of how God calls us all into service. It was one of the best parts of my job. I got to hear amazing tales of how the Holy Spirit works. And today we get a bit of a call story. We hear the call story of Peter, Andrew, James, and John. What is interesting is one little word in this story (that gets repeated twice): immediately. Jesus called Peter and Andrew and immediately they left their nets and followed Jesus. Jesus called James and John and immediately they left their boat and their father and followed Jesus. When was the last time you made a life changing decision immediately? How often are we presented with even the smallest dilemma and we take days, weeks, maybe even years to decide if we want to do it. It’s even built into our society; you normally can’t leave your job right away. Usually 2 weeks notice is appreciated and required. Here’s what I wonder…and I’m going out on a limb here because the text doesn’t say this. But, what if, just if, the disciples (Peter, Andrew, James and John) were fishing while they were waiting for that “next” thing. The thing that was going to be bigger, better, and full of opportunity. And along came Jesus. Friends, how different would our lives be if we lived in a state of anticipation instead of living in a state of hesitation? I’m going to let that question sink in just a bit. What if we lived in anticipation instead of in hesitation? There is this Jim Carrey movie from 2008 called “Yes Man.” It’s about Carl (played by Jim Carrey) who, after attending a seminar with incredibly happy people, has been challenged to say “yes” to everything in his life for an entire year. You could say that Carl was living in anticipation instead of hesitation. Here’s the thing, the idea sounds great, doesn’t it? Living in anticipation instead of hesitation sounds almost seductive. Maybe you think it means you could leave all responsibility behind. You could live fully into whatever life you think God is calling you towards. Living in anticipation means no longer having a “let me think about it” mindset but instead saying “it’s about time, let’s do this” mindset. Do you want to know what I think? The idea scares the you know what out of me. And ultimately what it comes down to is control. If I live in a life of hesitation, I can control it. I can control my life. Now, I know how dumb that sounds. I know God controls my life, but I like to think that I do, so please let me continue thinking this. If I live a life of hesitation, I can always fall back onto “now isn’t a good time” or “maybe later” or even my favorite excuse “let me talk this over with my spouse.” What do I have to fall back on if I life in anticipation. If I live my life in anticipation, that means I must fully trust God. Whoa. I don’t know if I can do that. I mean, if I give God total control of my life, that means I no longer have any say; I no longer can control what happens. If I give God control of my life, I must look my own shortcomings right in the eye. I must come face to face with my own sin. And brothers and sisters, my sin is ugly. I don’t have a scarlet letter I wear for all to see, but when I look in the mirror, it’s there. Every time I’ve failed, fallen short, screwed up, and tried to do life on my own, it’s written all over my face for me to see. I see a broken and bruised sinner who can only be healed by a cross-shaped band-aid. The Mr and I bought a new kitchen table. It didn’t happen the way we thought it would, but we now have a kitchen table. See…we walked into our local furniture store chain, looking for new chairs for my office. And the magical word “clearance” beckoned me closer. There it was in all of its clearance glory. We had talked about a new kitchen table. After all, the one we had, Mr had since he was in college. The table, as my parents say, didn’t owe us anything. The price was right and so we bought it. It was delivered to our parsonage today. And it already feels “familiar.” It’s as if this was meant to be our table all along and we didn’t realize it until it was in our house. We dreamed dreams here. We made plans. We did homework. We filled out college applications. I watched my mother do bills at the table every few weeks or so. The Sunday paper was fought over. My husband and I ate left over wedding cake and opened cards there the day after our wedding. My parents were sitting there when we told them we were expecting our daughter. I’ve sat around that table with my best friends. It was a place of comfort during deaths. It was the place we sat when we were told about major job changes. And slowly, a leaf came out. There were less chairs at the table. But, whenever we go “home” that is the place we sit–still in the same spots we always sat at (me between my father and brother). The poor in-laws (my husband and brother in law) are relegated to the bar to sit. Sure, it’s not comfy or cozy like a sofa or lazy boy, but it’s just as important when thinking about the times of comfort, joy, sorrow, grief, laughter, and love. And now we have a place like this all our own in our new home. Our daughter is young enough that she won’t ever know a time in her life when we didn’t have this table. She will create her own memories at this table. There will be serious discussions. Times of laughter. Games played. New foods tried. Tears over “love” lost. Later there will be homework done. College applications filled out. Her best friends will sit around that table. And eventually, it will get smaller too. It’s just a table. But, it’s so much more than that. It’s one of the few places I can go where I can be genuinely me. Our kitchen table is a place of acceptance and will be open to anyone. So it is too with the Lord’s table. When you come to feast on body and blood, bread and wine, I hope it is a place where you can be genuinely you. You are always welcome at the table even if you’ve never been before, or if you’re there every day. It doesn’t matter what you wear to our table or the Lord’s table. Your heart is all that matters. At the Lord’s table you are fed, nourished, loved, forgiven, and cherished. So I hope it will be too at our new kitchen table. Come. All are invited to the banquet table. Sunday drive; but not when I have someplace to be by a certain time. hear Jesus say in the Gospel of John. referred to in that way twice. tell them “I’m a pastor” they then just stare. I don’t know what they were expecting. you looking for light in the darkness? Are you looking for hope? Laughter? Love? again in a week and my answer may change. right in front of them? Do you? we need has already been given to us in the cross. searching in your life, or that you may not know what you’re looking for. It’s in those moments that maybe what you’re looking for has been here all along: cleansing waters, a fulfilling meal, and forgiveness in a cross.